Enveloped. 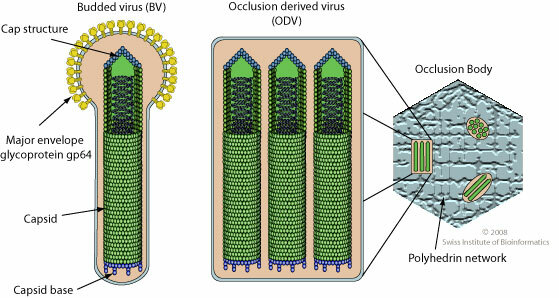 extracellular baculovirus virions can be found in two forms: OV (occluded virus) and BV (budded virus). The nucleocapsid is about 21 nm x 260 nm. Circular dsDNA, 80-180 kb in length, encoding for 100 to 180 proteins. Attachement of the viral glycoproteins to host receptors mediates endocytosis of the virus into the host cell. Fusion with the plasma membrane. The DNA genome is released into the host nucleus. Immediate early phase: host RNA polymerase transcribes viral genes involved in the regulation of the replication cascade, prevention of host responses and viral DNA synthesis. Late phase: The virally encoded RNA polymerase expresses late genes. Replication of the genome by rolling circle in nuclear viral factories. Nucleocapsids are formed which can either bud out through the cellular membrane and disseminate the infection or be occluded for horizontal transmission. Occlusion phase: the virus becomes occluded in the protein polyhedrin and the polyhedral envelope (calyx) is produced. Lysis of the cell releases the occluded virus. ETYMOLOGY Baculo: from latin, “stick”. Referring to nucleocapsid shape.